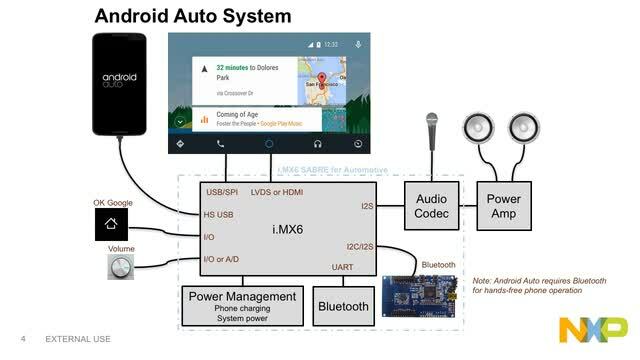 NXP®'s software for Android Auto provides a complete software solution for auto infotainment systems based on i.MX application processors. Android Auto provides a simple and intuitive interface for Android mobile devices that minimizes distraction so that focus can remain on the road. Capture of user input from touch screen or hardware buttons and provide to Android mobile device. Manage audio streams, instructions and calls from iPhone, audio entertainment from an Android phone, radio tuner or other sources. Voice input for Google Now and phone calls.